We are “technically” into spring now and although New York is predicting another darn snowstorm tomorrow!, it’s not stopping me from doing some major spring cleaning. Although I haven’t quite hit that warm-weather stride just yet, as what was 60 degrees on Saturday, is a freezing a high of 30 today. So,that leaves us wondering what will be the key power players in our wardrobes when it does warm up? I am officially sick of my skinny jeans by now but I also can’t seem to warrant wearing sweatpants either. I will do a pencil skirt for going out, but as for pant options.. remember those split skirts back in the day? I had a few pair in light denim; they were awesome then and are even better now. 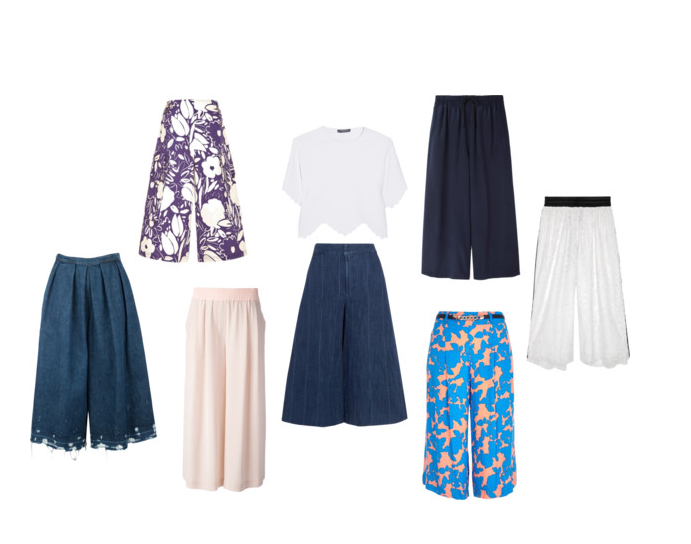 Culottes are officially the new must-have pants for spring. They were originally developed to provide women more freedom to do activities such as gardening, gardening, cleaning, bike riding, etc. and still look like one is wearing a skirt. I especially love these cropped flare pants from Proenza Schouler. I faced this dilemma over the weekend when I wanted to wear a crop top but wasn’t loving the current bottom pairings in my closet. Truthfully, I’m on the fence about whether or not a vertically challenged girl like me, can rock this look but only time will tell. Check out my picks starting with the Alexander Wang crop top, and let me know whether you can challenge your style and your wardrobe by adding one of these babies down below.